For close to 20 years, Damon Bard has been working as a freelance artist in the entertainment industry primarily as a sculptor but also as a designer of characters and creatures. Since then, he has contributed to nearly 30 films and other various projects during his career. 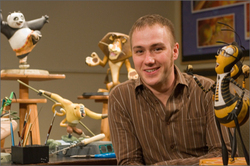 Damon has also been fortunate enough to have worked along side some of the most talented, acclaimed, and awarded artists and directors in the industry and on a few of the most successful films ever made; Coraline, Kung Fu Panda, Ratatouille, Shrek 2, Star Wars: Episode 3, Over The Hedge, and Madagascar, to name a few. Additionally, Damon works on his bronze figurative sculpture and oil paintings between and during projects as time allows. Bard Sculpture Studio is committed to furthering the excellence of the art of character design in the Animation and Visual Effects Industry by continuing to create using traditional/modern sculpture techniques and design methods to bring the most memorable characters and creatures to life for audiences around the world to experience and enjoy. Damon currently resides in Emeryville, CA where he works and maintains a fully equipped studio to offer the best character services possible.